ABDIWELI MOHAMED ALI, Prime Minister of Somalia, said the seemingly unending humanitarian crisis in his country had many and varied causes. Several factors — including decades of conflict, the demise of the central State, poor and kleptocratic leadership, struggles between clans for limited resources, and cycles of devastating droughts — had created chronic food shortages and an underdeveloped economy, and had driven the population to despair. Furthermore, the global terrorist organization, Al-Qaida, had in recent years sought to exploit such divisions to plot and execute attacks on the rest of the world. A small minority, mainly the Al-Qaida affiliated group Al-Shabaab, was responsible for the current nation-wide famine through their policies of systematically looting grain stores, forcible recruitment of farmers and their families, and preventing access by aid agencies to the most affected regions in the south. Al-Shabaab’s threats were not limited to within Somalia’s borders, but were exported by foreign fighters to the rest of the Horn, creating insecurity, an influx of Kenyan and Ethiopian refugees and regional instability. He said his country was doing what it could to fight terrorism with its limited resources. The retreat of extremists from Mogadishu earlier this year was a welcome development, which would allow improved access for humanitarian assistance. However, the retreat might also herald a new and more dangerous phase of conflict as extremists increasingly turned to suicide bombings and the use of improvised explosive devices targeting the civilian population. Terrorism preyed on decaying States, exploiting poverty and ungoverned space to radicalize, recruit and plan. In that regard, Somalia’s leaders were redoubling efforts to achieve national reconciliation and to adopt a road map for the re-establishment of permanent, legitimate and representative government of the country. The National Consultative Conference in Mogadishu had been the culmination of a Somali-led reconciliation initiative dating back to the Arta Declaration of May 2000, and represented the best hope for the country to establish a firm political foundation from which to rebuild, he said. The road map was a significant achievement for the Somali peace process, and shed light on the remaining transitional tasks, such as drafting and promulgating a new constitution. He thanked the African Union, especially Uganda and Burundi, for their support in that regard. Though dangers may lie in the shadows, Somalia would not divert from the path illuminated by the road map, and he asked partners for their continued help on the journey towards full sovereignty. Despite the many challenges, fragile gains had been made. It was critical for the Somali army and African Union Mission in Somalia (AMISOM) to be reinforced, in order to prevent a security vacuum in the areas of Mogadishu recently vacated by fleeing extremists, and to make the city safe for residents and aid workers. Somalia needed outside help to rebuild its economy and provide jobs for the millions of young people deprived of opportunities owing to the anarchy of the past two decades. Somalia might have eroded the trust of the international community in the past, but the country could and would do better — Somalis demanded and deserved a Government that put national interest before personal ambition. The new Transitional Federal Government was making efforts to instil a sense of patriotism and responsibility, increase professionalism, and strengthen governmental mechanisms. 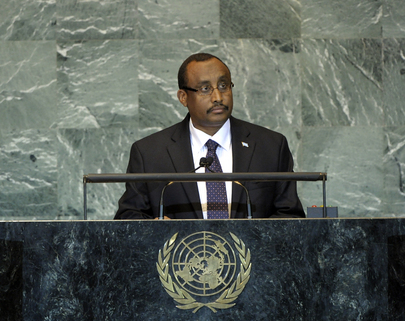 He said Somalia was truly Africa’s “sleeping giant”, where a relatively small investment would go a long way. With the longest coastline on the continent and bountiful and unexploited natural wealth, a peaceful Somalia would be a force for moderation and prosperity. For the time being, however, the humanitarian situation in Somalia remained dire, and he expressed gratitude to the international community for its pledges of assistance. However, without urgent intervention, three quarters of a million people might perish in the next few months. It was critical, therefore, to accelerate efforts to reach those living in the Al-Shabaab-controlled areas, and the international community must urgently reinforce efforts to extend the zone of safety for aid workers beyond Mogadishu and into those affected areas. The future of Somalia hung in the balance and with it, the prospect of peace, stability and prosperity in the Horn of Africa and security for nations across the world. Resolute global action was now required if Somalia was to consolidate and build on the gains already made and extend them to the rest of the country for the sake of future generations.